I want one. I wanted one since i have heard Kraftwerk and seen the DIY Elektor Vocoder. But i didn't have the means. Now i have. Jürgen Haible's Living Vocoder was a great inspiration for me. 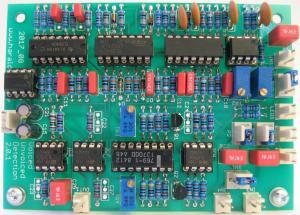 I have had his really big PCB from the Living Vocoder in my hands. What an impressive work! But i wanted something more flexible and modular. The first thought was to make it like the Elektor Vocoder, one complete channel per frequency band. But then, if you want to change the frequency or filter architecture, you have to replace the whole channel. So i decided to make the filters replaceable. 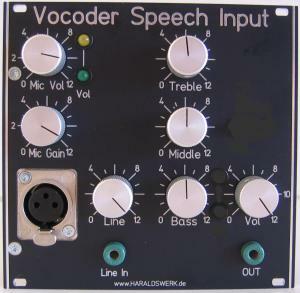 It is possible now to alter the characteristic of the Vocoder by changing just the filters. I studied Jürgens Living Vocoder, the Elektor Vocoder, the ELRAD Vocoder, ETSI Vocoder, EMS Vocoder, Sennheiser Vocoder and some more. And picked up what i think might be useful for my approach. My design holds up to 24 filters in steps of eight. So you can start small. All control voltages are brought out, so you can patch the channels to you liking. This makes for some really weird effects. All components are available (2017) and through hole with one exception. Some 0805 SMD capacitors are used in the bandpass filter. But they are big enough to be soldered by hand without problems. One optional module, the display unit, shows the control voltage per channel. It is attached to the Vocoder Analyzer part. You have a optical control over the incoming spectrum. Never seen this before with a Vocoder. The NGF Vocoder Analyzer divides (analyzes) the incoming signal in frequency bands and derives a control voltage according to amplitude of frequency. It consists of up to 24 filters. 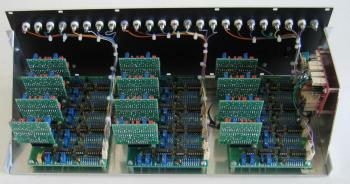 Eight filters per backplane. The NGF Vocoder Display visualizes the amplitude of certain frequencies in the incoming signal. The NGF Vocoder Synthesizer modulates the incoming exciter signal with means of the control voltages derived from the incoming speech signal of the NGF Vocoder Analyzer. It is quite interesting to us other control voltage sources as well. Experiment! The speech input consist of a microphone preamp, a line input and a tone control. 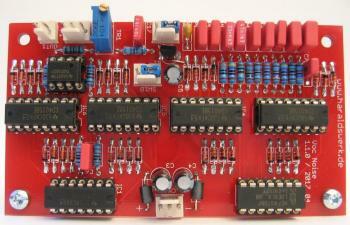 It is the front end to the NGF Vocoder Analyzer. Here is the noise module for my Vocoder project. This noise generator is not only useful for the vocoder but also for various other audio and acoustic measurements. The output can be switched between white and pink noise. The pseudo random noise is produced with the aid of a 31 bit shift register. Zero inhibit technique is used. This design follows closely the original from the Elektor magazine. The voiced / unvoiced module detects if the incoming speech signal consists of more higher or lower frequencies. It switches the exciter signal between noise and carrier signal. To handle the great dynamic range of the Shakuhachi I needed a compressor for my Shakuhachi 2 Synth project. Because a limiter is not that different I added this feature as well. This comes in handy with my Vocoder project also. The structure used here is derived from "Small Signal Audio Design" by Douglas Self p682ff. The audio signal did not flow through a VCA as in many other implementations. Instead the compression or limitation is done by subtracting the audio signal at the output summing node according to the control voltage derived from the audio signal. The slew rate of the control voltages coming from the NGF Vocoder Analyzer can be slowed down or/and "frozen". This stops the output signal of the NGF Vocoder Synthesizer following the input signal from the speech input and holds the last stage. Provides the needed voltages and current. Linear stabilized.